We are in the middle of another great PFAST (Parent & Family Advocacy and Support Training), so we are spending more time then usual on the DPS website and have been finding some new tools and information. If you have a Kindergarten-5th grade student you might be interested in the district's new report card format. DPS is transitioning to using the levels 1, 2, 3, & 4 that you may be familiar with from End-of-Grade (EOG) Tests as the report card ‘grading’ method K-5 for every school. Previously you saw this mostly in grades K-2 with letter grades (the traditional A, B, C, D, F) starting at third grade. DPS has produced a guide on their website that you might be interested in reading. It doesn’t give copies of the report card, but more so the description of what the numbers mean and how it relates to your student's progress. The new report card format is designed to reflect more specific standards and more closely align with the new Common Core Standards. Parent Assistant, an online access point for your student's data K-12, is available to Durham Public School parents who sign up at their school. Parent Assistant gives you access to grades, credits, attendance data, courses, and much more. You do have to go to your school, see the NC Wise Data Manager, and show a photo id to get started. Just go to the front desk to find and ask for them. Here's more information. It sounds like a great tool for parents! Durham Education Resources would love to hear more about your experience with Parent Assistant. Anyone tried it? How does it work for you? Was it easy to get started? A free forum "Engaging African American Parents, Fostering Our Children's Success" will be held at NC Central University on this Saturday, October 27 at 8:30 a.m. A continental breakfast will be served. The keynote address will be given by Dr. Wynetta Lee, new Dean of the School of Education at NCCU. Workshops on the under-performance of black students and other topics will be addressed. This is the Durham Committee on the Affairs of Black People's 1st Annual Education Forum. 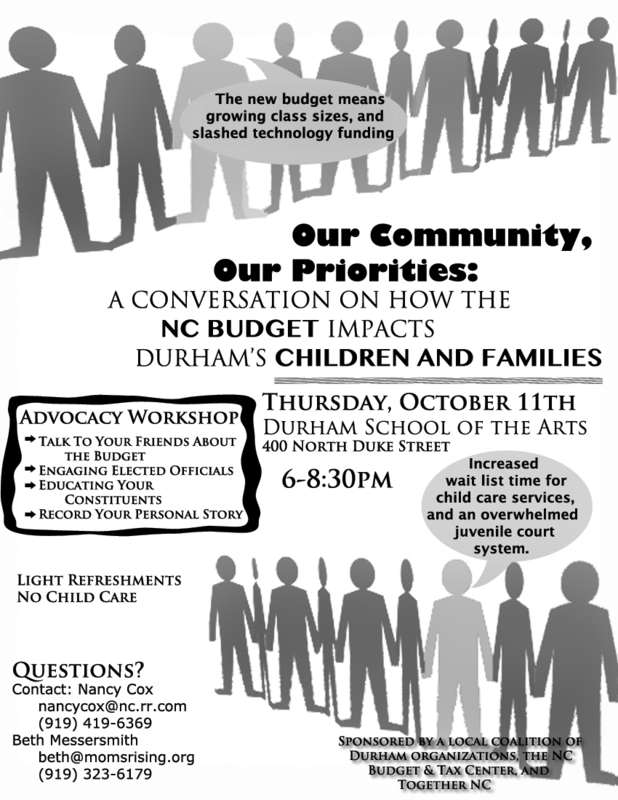 The Our Community, Our Priorities Event and Advocacy Workshop at DSA on Thursday October 11th is an important opportunity to learn more about how the State budget impacts local programs and schools. Cooperative Extension’s Strengthening Families Coalition is one of the sponsors of the event. 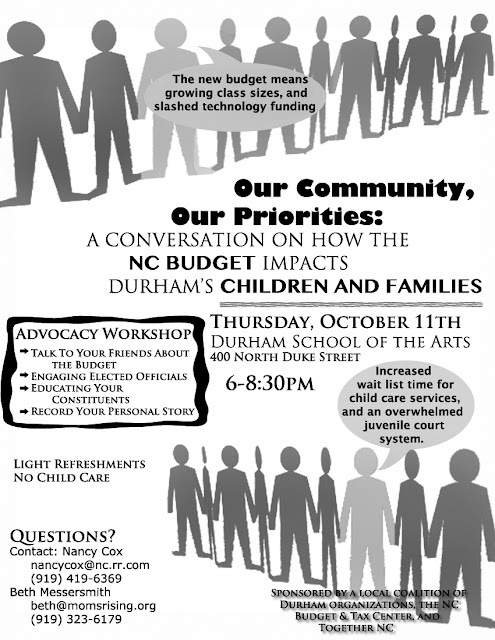 We will have a table and I will be participating in a conversation about advocacy skills regarding the budget. Please consider attending. Make a difference for your child--PFAST Training for Parents starts October 9th! Do you want to better navigate our public and charter schools to help your child succeed? Have you received your child’s first progress report and it is not what you expected? Do you find the maze of school choices confusing? Do you want to better understand the programs schools offer for your child? Are you an advocate for a child and want to know more? Do you have an EC or AIG child who needs support? If you haven't yet, you will want to consider taking the popular Parent & Family Advocacy and Support Training (PFAST) starting Tuesday, October 9 from 6:00-8:00PM at Durham Cooperative Extension, 721 Foster Street. This six-week workshop series will help any parent K-12 better navigate our schools and build partnerships—public and charter schools—to help your child succeed. Dinner is included and childcare is available. A flyer and registration form are available at the links below with all dates and more information. Please note this is the only open series for any parent from any school before 2013.
Who should come to PFAST? v ANY Parent K-12 who just wants to know more about public or charter schools and how to get the most of your child’s education. v Parents from other countries who want to better understand the American education system and Durham & NC in particular. v Parents with Pre-K Children who want to know more about schools and make choices for the future. v Parents who have children in Middle or High School and are encountering new challenges. The program will accept registrations up to October 9th depending on space. Please call Donna Rewalt, PFAST Coordinator, at (919) 560-0538 or by email at drewalt@durhamcountync.gov if you have questions. Also, LPFAST in Spanish will be offered at several schools through a partnership with DPS starting in November. We will share more information when the dates and locations are set. ABC's of IEPs training on 10/6--Register today! THE ABC's OF IEPs," facilitated by the Exceptional Children's Assistance Center (ECAC) is a great workshop for any parent, guardian, or those working for young people with special needs. The ECAC workshop will make a difference for your child or those you work with. This free workshop takes place this Saturday, October 6th, 9:00am-3:30pm, at the Shared Visions Retreat Center, 3717 Murphy School Rd., Durham. It is well worth the investment of your time. If you have a special needs child who either needs or currently has an Individualized Education Program (IEP) in school, this workshop will provide you with vital information to help you navigate the special education system. Professional treatment providers and educators are also invited to attend and are requested to bring a parent with them. This workshop is free of charge and includes all training materials, refreshments and lunch! If you get this after the registration deadline, call them directly as they may still have space. 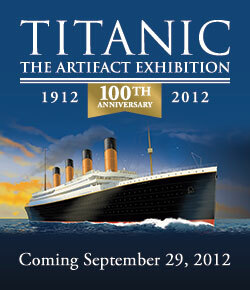 The North Carolina Museum of Natural Sciences in Raleigh is bringing the Titantic artifact exhibit to town starting September 29th through April 2013. I experienced it with my family several years ago and found it very educational and an opportunity to talk about the issues and ideas that the exhibit explores through the very personal artifacts shared. There is a charge for this special exhibition and a student rate, but entrance to the museum as always is free! There are also opportunities for group rates and it seems like a great topic for a project or paper. Some of you may already know about the Magic Johnson Bridgescape Academy which is part of DPS and serves students grades 9-12 who have dropped out. It sounds like a great dropout recovery program. It offers a combo of online and face-to-face learning. If you know someone who has dropped out and needs a second chance, take a look and share the opportunity with them. We recently received the lastest copies of Durham Public Schools' High School Requirements in English and Spanish. It is easy to read and understand. Check out the links below. Many of you may have missed the addition of one social studies credit by the state of North Carolina for those starting high school in this 2012-2013 school year, which brings the number of social studies credits required from 3 to 4.. Students entering high school prior to this year are not required to complete this additional credit. The state frequently tweaks high school requirements, but students are only responsible for requirements in the year they enter high school. DPS, like many larger systems in NC, requires more credits than the state minimum. Durham requires seven additional elective credits, which gives students more options and may better help prepare them for work or college. Many folks ask about the fewer number of credits required for students at Durham School of the Arts (DSA). This has to do with scheduling--other Durham High Schools use a block schedule, which allows you to take more courses in a year, and DSA uses a traditional schedule. This series of Wrightslaw articles were written for parents who have children with special needs and IEPs. For these families, keeping up with your children's educational paperwork is essential and can have an impact on your child. However, many families can benefit from the concept of putting together their child's educational history in an easy to access format. We have seen this type of organization benefit families in IEP meetings and other situations when sharing or examining the right information at the right time is important. Organizing your files also helps you get a better perspective of your child and his or her progress. Just click on the link and scroll down for the articles. If you don't have the records you think you should have, ANY family can request educational records. You may have to wait a few weeks for the school to get them to you or pay a modest fee for copying, but they can be helpful. In addition to grades and test scores, your child's records include information about discipline, attendance and other items about their performance or educational interventions. In PFAST training, we encourage all families to keep up with key educational records. An organized system like the one Wrightslaw describes is most helpful, but if you at least put them in the same accordian file, drawer, or shoebox, you will have a better chance of finding what you need. We also recommend saving a few work samples, particularly in areas your child struggles, but also in areas where your child is doing well. So, this summer, pull those records together, get them organized and be ready to start the next school year prepared! Awesome Local Government Seminar for Teachers with Credits! Check out this great Local Government seminar happening in Durham and open to any educator in NC. You get great strategies for helping your students understand and care about local government -- plus a free Bulls game, meals, and other goodies to boot. One of our Extension co-workers with our Kids Voting Durham Program took this training and gives it two thumbs up. Check out this offering and others from the Civic Education Consortium at UNC. 1) If you are currently in Algebra I (in middle or high school), you will continue with the sequence of Algebra, Geometry, and Algebra II. Teachers teaching these courses will be infusing those courses with Common Core practices. Students who will start their High School Math Sequence next year (whether in middle or high school), will start with Common Core I (replaces Algebra I). 2) Students who are advanced math learners in Middle School will take compacted math courses 6th grade Plus (covers 6th grade and part of 7th) and 7th grade Plus (covers rest of 7th and part of 8th) leading to Common Core I in 8th grade. Most students in DPS will take the more rigorous Grade 6, 7, & 8 standards preparing them for Common Core I in the 9th grade. 3) Some students, who meet the more rigorous criteria, will be able to take Common Core I in 7th grade, but this will likely be fewer students than take the course currently as the demands of Common Core I are greater than the current Algebra course. (This appears to be the approach of other local districts as well.) EVAAS scores (a predictive program developed by SAS) and other measures will be used to determine eligibility. 3) None of the changes affect whether a student meets high school graduation requirements or receives credit. so, Algebra I and Common Core I provide the same credit. These apparently should not affect college admission either as this is a change for 45 states and D.C.
A few general observations: Other countries (who are kicking our American butts academically), usually explore fewer topics, but go much deeper into those topics with application and using the material. This is the direction that Core Standards are supposed to take us. --Language Arts will become more a part of all courses with writing, reading, etc. --Greater emphasis on more complex texts and using non-fiction, informational texts and producing arguments, evaluating sources and evidence, etc. Part of the idea here is that our college and work lives demand a much higher level of ability to understand and evaluate complex non-fiction texts that our current standards do not emphasize. --More emphasis on using multiple texts, so studying Africa and reading articles, a piece of literature, a biography, using maps etc. as part of this study as opposed to just reading a textbook. --Math will be much more rigorous and integrated, so this will bring Geometic concepts into Algebra in Common Core I, rather than separating Math out into discrete bundles as most of us were taught. Problem solving and application will be emphasized throughout. --Testing is about to undergo a transformation in math and language arts as well, with a shift to new national online assessments that are supposed to be in place by 2014. Last night they referred to the fact the state will be making changes to current assessments to prepare for this transition. Overall, the depth of what is expected in terms of learning is a shift. The devil is in the implementation and it will take some community support and focus as these shifts are made. It will have an impact on how teachers teach, so we should consider advocating and supporting teacher training and the time needed for teachers to fully engage with the new standards. Though, there are teachers and schools that already use many of the practices of good teaching that these standards demand; for others, this will require developing new skills. It seems there needs to be time for teachers to share and learn from those who are ahead on this. DPS did address some of their teacher training plans. We've briefly surveyed common core information from some of our neighboring school systems, like Chapel-Hill Carrboro, and we appear to be handling this in a similar way. We are hopeful that the questions asked at the sesion will result in some pretty clear FAQs and more detailed DPS-specific info online as well as some additional info sessions at the district and school level this fall, so more parents can understand the practical impact on their children. If you attended the elementary session on Tuesday evening and would be willing to share a summary or your own observations about this, let us know. There are Common Core Standards Sessions for parents this week--tonight, Monday 6/4, for middle and high school parents and Tuesday 6/5 for elementary school. These new standards will change the way our schools teach and how classes are organized, particularly in math at the secondary level. Check below for the details. Want to stop the summer brain drain? We really like these research based tips for summer learning. Parents always hear 'read every day,' but when have you heard 'do math every day'? These are some good suggestions connected to research. Wrightslaw is a website dedicated to providing parents, educators, and advocates with reliable information about special education law, education law, and advocacy for children with disabilities. Wrightslaw offers information about key topics around exceptional children, such as Twice Expectional, IEPs, evaluations, and how to write an effective letter. The founders of Wrightslaw, Pete and Pam Wright, are both tireless advocates--Pete is an attorney and professor who argued a successful special education case before the Supreme Court and was diagnosed with dyslexia at age 8. Pam is a psychotherapist and writer. The current issue of the Wrightslaw e-newsletter, The Special Ed Advocate, focuses on how to help struggling readers. You can subscribe to the newsletter HERE. I also recommend their training seminars and books for parents. You can see information about all of this on their website. Their training seminars are delivered all over the country and are invaluable to all parents and advocates, even if you already have some experience. From Emotions to Advocacy and All About IEPs are a great books for parents. We also have these books in our resource library here at Cooperative Extension if you want to take a look. Durham Public Schools is on the hunt for volunteers to serve as test proctors as the end-of-year testing period gets underway. Testing has already begun at many schools and next week is a really big one. Volunteer test proctors are needed to monitor the students during tests. Proctors are provided guidelines to follow and typically serve with a staff person as two adults are needed. Staff cannot cover the need, so community volunteers are needed. It is an easy volunteer job and much appreciated by the schools. You do not have to have a child in school to be a proctor. To volunteer to serve as a test proctor contact Sheila Miglarese, volunteer services coordinator, at sheila.miglarese@dpsnc.net or 919-560-2156. There are some really great (and free!) workshops offered throughout Durham tomorrow as part of Children's Mental Health Day tomorrow, May 9th. They are open to anyone and include topics from teen depression and the effects of trauma on children to Yoga. Most are short, but I highly recommend the nationally recognized Stewards of Children Training at 2:00. It is for anyone who cares about protecting children and teens from child sexual abuse and it is very eye opening--I realized that I didn't know nearly enough. The statistics show that 1 in 4 girls and 1 in 6 boys will be affected in their young lives. In light of the Penn State situation and others, it seems obvious that many of us simply don't know. Thinking we're aware is not enough. Take this training and find out what you don't know. It is also a training that can be offered locally to schools, workplaces, organizations, churches, etc. who want to host a training. I would be happy to put you in touch with our local organizers if you are interested in that opportunity. Check out the link for more information including the times and locations of all of the workshops. In recent months, we have seen a lot more engagement of Latino parents with DPS leadership. This Thursday, May 3rd, at the Durham CAN Spring Assembly Meeting, DPS Superintendent and school board members will be present to hear from Durham CAN delegates and the group's Latino Parent Council. The Latino Parent Council recently met with the superintendent to talk about the needs of Latino parents and make a few requests for support, including additional translation services, translation of key IEP components, supporting LPFAST (Latino Parent & Family Advocacy and Support Training) for parents in DPS, and other important items. LPFAST developed out of the Strengthening Families Coalition at Cooperative Extension. It is good to see this training valued and used by parents--some of the parents in the Council are LPFAST grads. If you hope to go Thursday, the meeting takes place at First Presbyterian Church at 7:00PM. We have also noticed DPS working to reach out in more creative ways with Spanish speaking families in our schools. DPS recently announced a partnership with LaMega Radio Station (1310AM) for a monthly talk show where DPS officials share important information in Spanish. Throughout the show parents can call in, text and email questions. Tune in on first Wednesday of every month at 10:30 a.m. to listen to the broadcasts. It will be interesting to hear what parents think. We will let you know what happens at the Durham CAN meeting. Please share your thoughts if you have a chance to attend and even if you don't.